Watch my video! Please follow my page on Facebook for updates on new videos for beginners in baking, every Monday! Click here to subscribe to my You Tube Channel. Click to subscribe now! Its summer and I know it has arrived in more ways than one! For one, its a little less difficult to drag myself out of bed at 5.30. Later during the day I feel less guilty pulling the kids out of bed, a little less envious about hubby sleeping luxuriously - till I threaten to turn on the sprinkler system over the bed (fantasy of course, which I would love to bring alive sometime!). The exams around the corner has me 'mentally preparing' my son (from morning) to study in the evening. I try in vain to tell my attention-demanding daughter how important it is for Amma to sit with Anna for the practice sessions. I am preparing myself mentally to put in more hours of work (while I live in a virtual madhouse, no less, with my kids), which means I will have to let blogging and baking take a temporary backseat (I am used to the luxury of working part time). While I worry about my son's exams and finding a good life-saving summer-camp, I also worry about making sure I have a few posts in my drafts (lest you forget me by the time we see the end of summer). Need to get the battery of the UPS replaced to help me run my system non-stop from morning till evening during the power-cuts. And hey! how about a power generator for my oven? Aah! Another fantasy! As the mercury levels soar and my bread dough rises faster than usual, I think about giving making dosa-idli batter another try. Oddly and embarrassingly, I have constantly had this problem with fermenting my batter. I earlier would not believe in some 'hands' being able to do this better than others, but now I am forced to believe it. I finally (and conveniently) gave up on making batter at home, I don't have a wet grinder, no space (I see your shocked face!). As my baking buddy's hubby remarks, we belong to the very strange category of people who go to great lengths trying things at home which normally people buy (like breads, cakes, puffs, ice creams) and buy things like idli-dosa batter which people normally make at home. I do cook fresh food everyday, but if given a choice, I would love to let someone take over the routine cooking and I would only bake. Goodness! I really must stop fantasizing! Kudos to many of you who manage to bake a lot and also cook everyday food with equal enthusiasm and passion. I remembered that I am probably kind of 'abnormal' in this respect (am not proud of this, trust me) when I wrote the pizza post and mentioned that I used home-made pizza sauce. This sauce is one you could use for making pasta too of course. 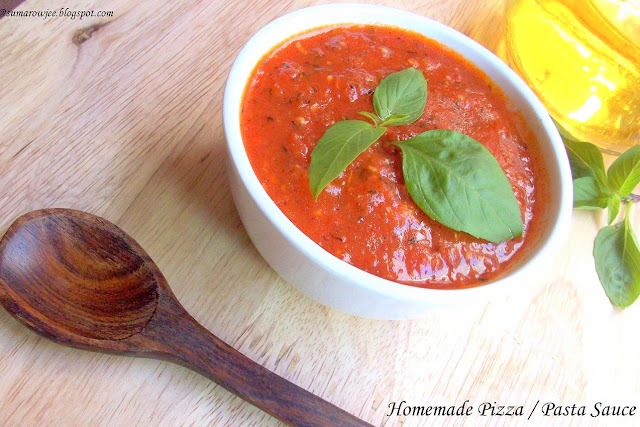 Very easy and quick, this makes fresh and simple sauce in very little time. Few ingredients here, but again, please do make sure that they are fresh and the herbs aromatic. Adapted again from Champa, who has made it from Heidi's 101 Cookbooks . The recipe uses canned crushed tomatoes, I have used fresh ones. I have blanched them to remove the skin and then pureed it in the mixer till quite smooth (my kids do not like chunks) you could leave it chunky if you wish. Please do alter the ingredient proportions to suit your taste. 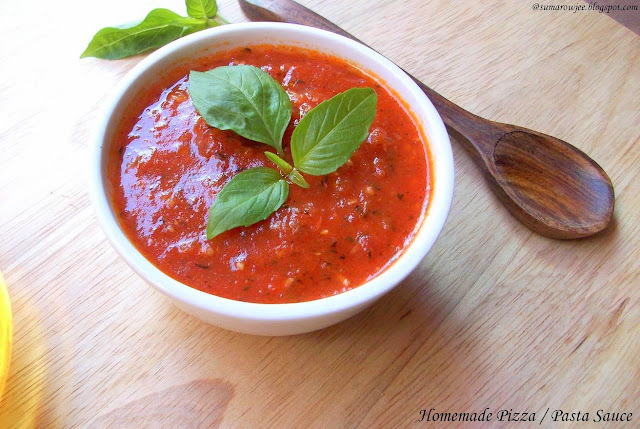 The below recipe makes about a cup of sauce, enough to make 3-4 9'' round pizzas depending on how much sauce you would want on your pizza. Double the recipe if you wish, as this keeps well in the fridge for 2-3 days. Procedure: Wash the tomatoes. Blanch them in very hot water for a couple of minutes. Cool, drain and peel the skim. Roughly chop into largish chunks and puree as you wish. (chunky, less chunky or almost smooth) I made mine quite smooth. Heat the oil in a heavy bottomed sauce pan. Add the grated garlic. (Heidi says, combine the olive oil, salt and garlic in a cold saucepan, then heat, I missed on this) On medium heat, saute for a minute or so, do not let the garlic turn brown. Add the pureed tomatoes, herbs, red chilli powder, salt, crushed black pepper and the sugar. Simmer on low heat for 2-3 minutes. Turn off the heat. Cool. Use as needed. Isn't this really simple? Thanks to Champa and Heidi, this will be a recipe I shall be using very often! One good thing about summer is,as you said,rising doughs and batters.Luckily,I've always had luck with idli batter,thanks to Chennai heat it never fails to rise(pun intended) to the occasion.Now that I have a wet grinder,it only became easier for me to whip up the batter.Lol about your hubbys comment:)).Sauce looks yummy,somehow I've always used it out of the bottle! really nice pizza sauce........i don't know how old your kids are...but they sound exactly like mine! (mine are 13 1/2 and 12).and i completely agree with you...daily cooking is a drag! Thanks to you, I bake so much more...I recently tried the no-knead focaccia from your blog and it turned out so well and so fast...Thanks for being such an inspiration !! Really very flavorful pasta sauce. Looks awesome. Love the colour of the sauce. 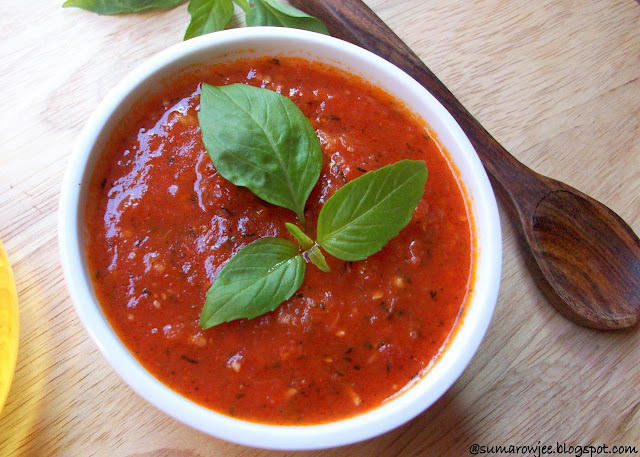 Summer is the best time to make this sauce for the tomatoes look red now. Ha ha :) Nice story! Love the way you describe your "buying of idli dosa batter". The sauce looks simply perfect. Had tins of olives, mushrooms and spinach in my pantry, waiting for the right day to get the sauce to make some pasta. I don't have to buy the sauce anymore:). Thanks for the wonderful recipe. mmm... yummy and colourful sauce. I was searching for this from so long, this looks simple and easy. Thanks a lot for sharing dear.